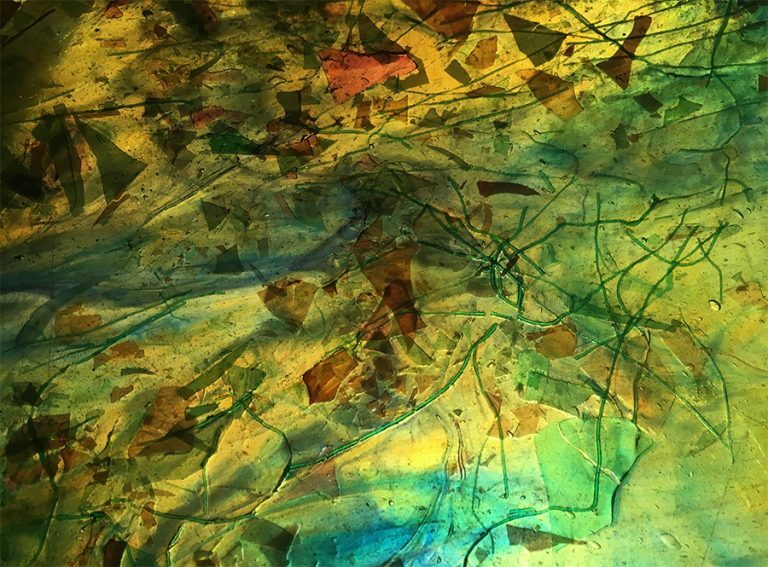 Since the establishment of Stelz Studios in 1980, Steven Stelz has been dedicated to producing beautiful works of art using fine opalescent glasses. Renowned for his artistic achievements in traditional stained glass, Steven Stelz creates fine opalescent leaded glass windows, lighting, screens, ceilings, glass mosaics and pate de verre lamps and windows. The results of his extensive study and enduring experiments with glass reflect the style, sophistication and extraordinary quality found in the old glass masterworks of the late 19th century American glass artists. 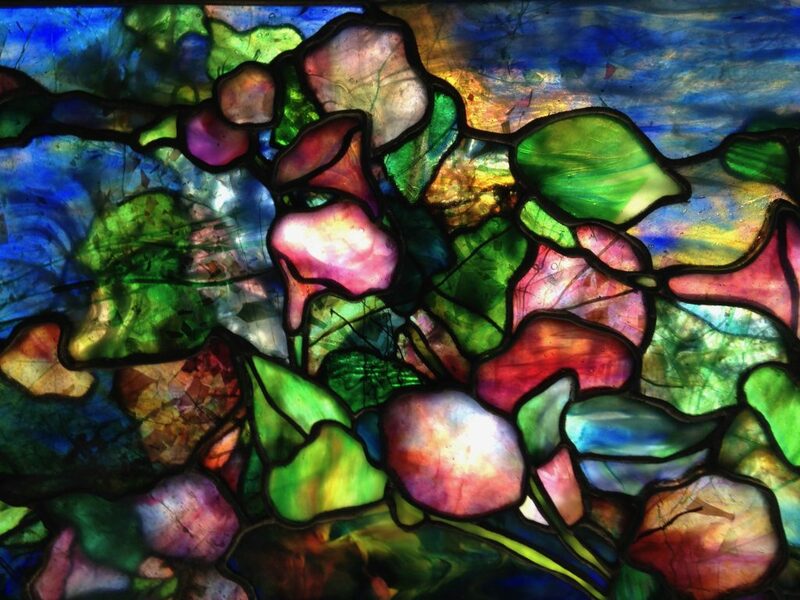 Louis Tiffany, John LaFarge, Fredrick Lamb, Maitland Armstrong and other 19th century American glass artists comprised a movement known as the American School of Glass. 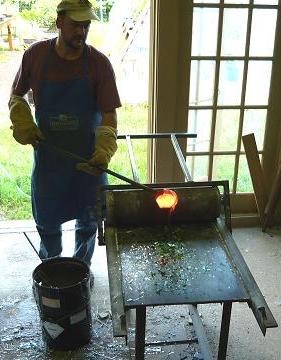 Stelz’s goal is to follow in the tradition of the American School of Glass techniques. The American School techniques and the glass itself differs greatly from earlier leaded glass works of the United States and Europe. Earlier windows relied heavily on the use of paint to create their windows. 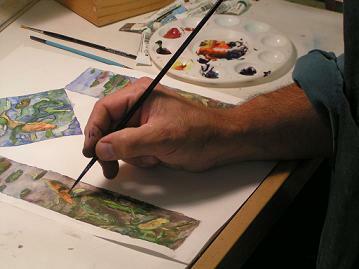 Whereas, the American School techniques incorporate hand-cast opalescent glass into the work. 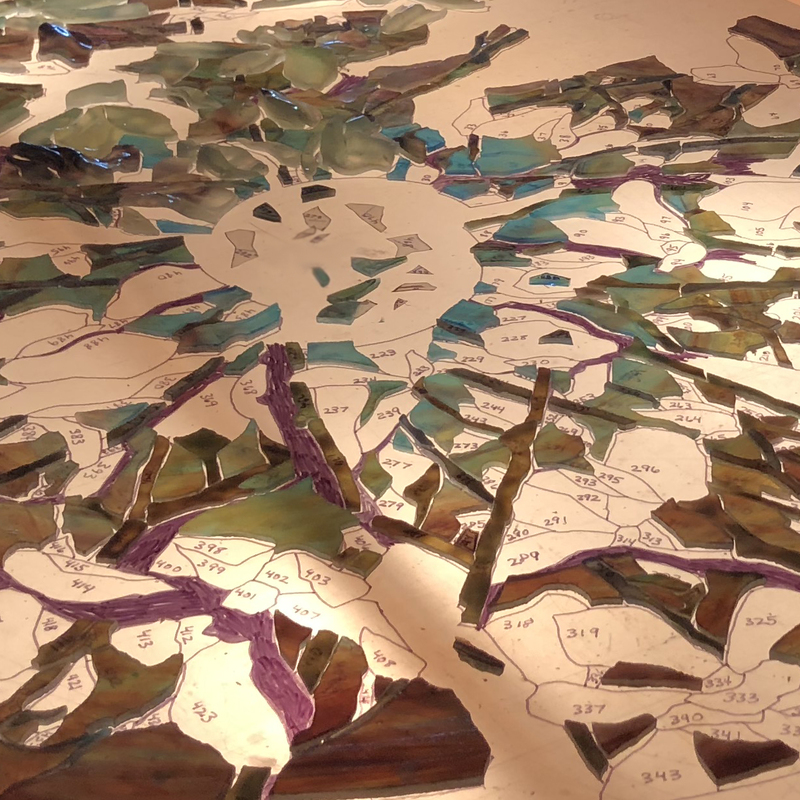 Color, tone and detail are expressed using the color and variegations found within the glass itself, while the application of paint is strictly limited to figural elements such as faces and hands. Another American School technique known as plating is effectively used in our windows. Plating is a multi-layering of glass used to manipulate a color tone and create the illusion of depth. Acid etching techniques, enameling, and other traditional glass treatments are also used as they were 100 years ago. Long forgotten traditional glass working techniques, pioneered by Tiffany and LaFarge and later abandoned by contemporary craftsmen, are once again employed by Stelz Studios. Stelz Studios maintains a very large library of fine, handmade, opalescent and cathedral glasses to be used in his work. Hand-cast opalescent glass was an American innovation, and is once again made in the traditional way at the Stelz Studios. 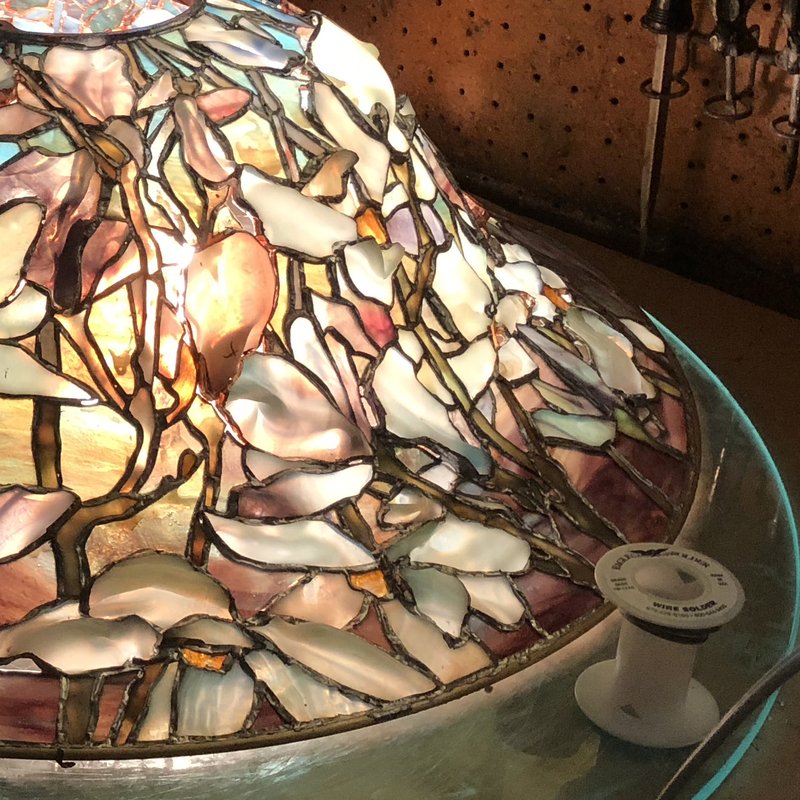 The ability to create his own glass allows Steven Stelz the freedom necessary to create his leaded glass works of extraordinary artistic quality, while not relying solely on commercially produced glasses. 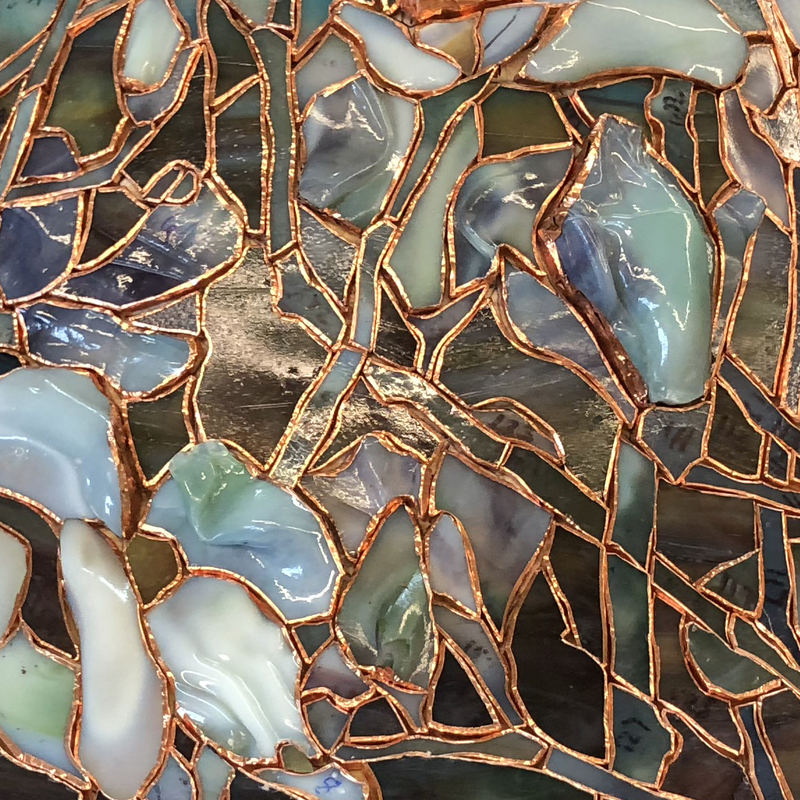 Metallic oxides and glass frits are added to the molten glass to create the desired colors. Some of the larger glass sheets are custom made for Stelz at other glass facilities. Stelz’s windows are custom designed for each client, and are not reproduced. 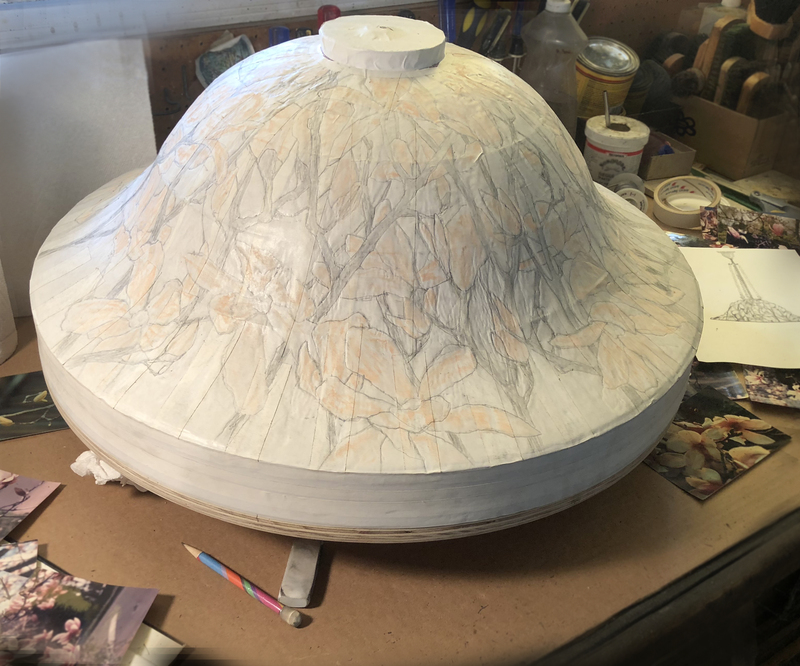 Our leaded glass lampshades are supported by finely cast bronze fixtures, and can be custom designed or selected from a variety of styles available. Please visit our gallery pages for more insight into our accomplishments in glass and perhaps some inspiration for your interior decorating endeavors. We do not maintain an inventory of completed windows or lighting fixtures for sale. All of our stained glass works are created by commission only and are custom made to order. The ability to produce his own hand-cast sheet glass allows Stelz the freedom to create fine works in glass true to his designs and watercolor renderings. 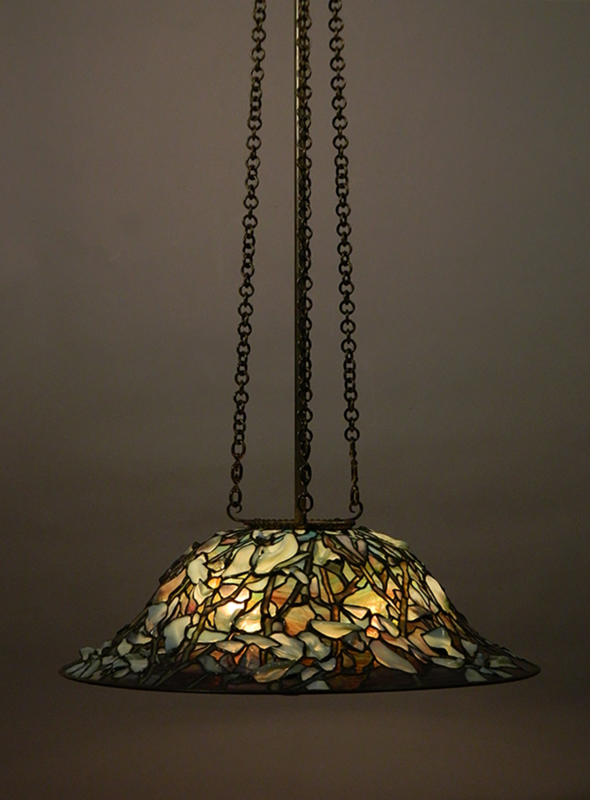 The first step in producing a window, lamp or mosaic is creating an original design called a rendering. This rendering is a watercolor painting which the client approves before any other work is begun. 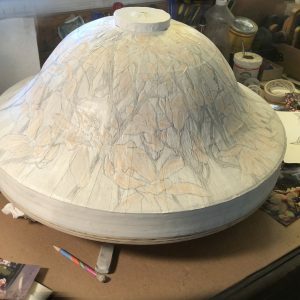 A full size drawing, called a "Cartoon", is then created based on the watercolor rendering and will be used as a pattern for cutting the glass sections. 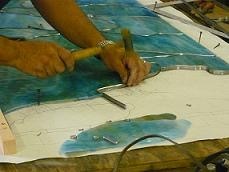 Steven Stelz creating Cartoon drawing for the Pearl Diver window. Leading a plated window using specially made lead cames to accommodate multiple layers of glass. 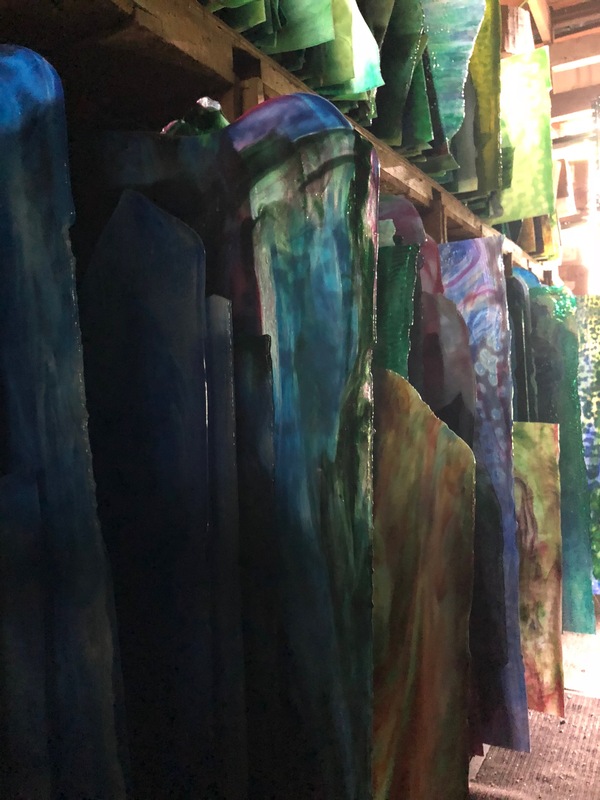 Hand casting (rolling) hot opalescent glass into sheets at the studio for use in our leaded glass windows, lamps and mosaics. Quality work, fine detail and artistry goes into each piece created by Stelz Studios. Stelz Studios maintains a very large library of fine, handmade, opalescent and catherdral glasses to be used in their work.